Wind farms occupy more land than nuclear power plant, are noisier and have a negative impact on the environment. Renewable energy has recently become a global fad. You might ask what could possibly be better for the environment and the national economy of any country than alternative power generation, such as wind power plants. In reality, though, no power sources that depend on the forces of nature are totally dependable, which means that relying on them for national energy security is at the very least a mistake. Just look at the situation in India’s state of Tamil Nadu, which at one time allocated huge tracts of land to accommodate wind farms. India has been perennially suffering from power shortages, with its appetite for electricity rising by the year as its economy grows. So, several wind generators dot the Western Ghat mountain range. The idea was for them to constantly generate very cheap electricity, except that, after the winds suddenly changed direction, most of the power plants simply grounded to a halt. The Kudankulam Nuclear Power Plant is now under construction right in the middle of this huge wind farm. “We are all waiting for this power plant. Everybody’s had enough of this electricity hunger,” Sundarajan from Kanyakumari, told RIA Novosti. The KNPP’s buildings are visible in the distance from the cape where the town sits. In this region, frequented by tourists and pilgrims, people are waiting impatiently for the Kudankulam to be launched. Hotels and temples alike need electric power. While wind generators are a dominant feature of the local landscape, their total combined capacity is no more than 1 GW. 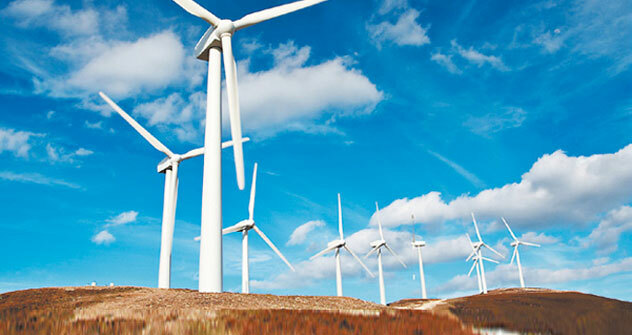 Powerful industrial-grade wind generators require an area of between 5 and 15 square kilometres per MW of installed capacity, depending on wind direction and the terrain. A 1 GW wind farm would normally sit on an area of 70–200 square kilometres, although this land could be partially used for agriculture, too, depending on the noise level and the degree of risk when accidents occur. For example, a blade ripped off from a large wind plant can be thrown as far as 400–800 metres. A nuclear power plant with several generation units occupies 100–200 hectares on average, which is smaller by an order of magnitude than what is required to accommodate a wind farm of comparable capacity. Acoustic impact is the most important factor of wind farms’ environmental footprint. Wind generators produce various kinds of noise, both mechanical and aerodynamic, which can be low-frequency (16-20 Hz) or high-frequency (between 20 Hz and several KHz). It is mostly the wind plant rotors that cause the noise. The noise level in the close vicinity to a wind farm can reach 50–80 decibels. Any sustained noise of 70–90 decibels can impair a person’s central nervous system. Wind plants with more than 250 KW-capacity present an added environmental risk, as the tips of their rotor blades spin at ultrasonic speeds, creating an infrasonic effect that is harmful to both humans and other living organisms. A wind plant of just 2 MW with 60-metre blades in the US state of North Carolina produces so much noise that it needs to be shut down at night. Nuclear power plants, on the other hand, are completely silent. There is nothing there that could hum, drone, or make any other kind of loud noise. Plus, nuclear power plants, if operated according to safety standards, have zero impact on the environment. In Europe, placing wind farms over bodies of water has become popular but studies have shown that this affects the migration of birds and fish. Finally, the serious negative environmental impact by wind farms includes a considerable weakening of airflows, with a potential for climate change and for obstructing the “ventilation” of neighbouring industrial areas. Wind plants also interfere with air traffic and with the spread of radio and TV waves. Nuclear power plants are free from all those flaws. Wind plants also compare poorly in technical respects, such as their capacity utilisation rate – a key parameter for any energy generator. This rate is important in that it indicates the plant’s overall efficiency, including not only its engineering perfection but also the skills of its staff, process organisation by the plant’s management, and the industry’s organisation at the national level, in addition to many other factors. Nuclear plants’ capacity utilisation rates reach 80 percent, while the best wind farms can boast is 30 percent.